GRAND Final winner Josh Jones says it took a brief stint in rugby union to make him appreciate his life in league. The 22-year-old centre left Saints at the end of the 2015 season to try his luck with Exeter but he failed to break into their Premiership team and opted to cut short his time in the 15-man code for family reasons, with partner Olivia expecting their first child in June. Jones was quickly snapped up by Salford and he will make his home debut for them against his old St Helens team-mates at the AJ Bell Stadium in round two of the First Utility Super League on Thursday night. Jones, who had never played rugby union before, says he has no regrets over his decision to quit Super League. “I look back on it with fond memories,” he said. “The boys were really good and it was an eye-opener to see what a different sport was like. “When you’re a professional rugby player, I think what people behind the scenes don’t see is you’re in it all day, every day, it’s your life, and sometimes you just need something different. “It gave me that something different, a chance to move away and experience a different life and a different culture. Jones made 94 appearances for Saints but was never likely to return to Langtree Park. “I spoke to a few clubs and it was nice to know I was still wanted back in rugby league,” said Jones. “I think leaving St Helens was something that I needed to do. I had long talks with (coach) Keiron (Cunningham) and I can only speak highly of him and the club. “I had been there for a very long time and I needed to freshen things up. To go back would have probably been a bit silly of me. 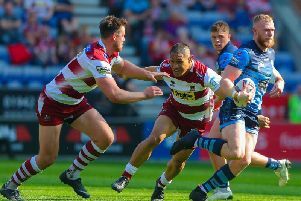 Jones and another former Saints player, Mark Flanagan, are among nine players set to make their home debuts for the Red Devils, while ex-Salford half-back Theo Fages will make his first appearance for Saints and Lama Tasi also faces his former club. Jones says the new-look Red Devils will be looking to atone for their 42-20 defeat by Hull in their opening game last Friday. “It was disappointing,” he said. “Some of the tries we conceded were very poor on our behalf. We’ve had a good look at ourselves because we know that wasn’t good enough.